one of the great things about being a blogger is finding out about cool new events. 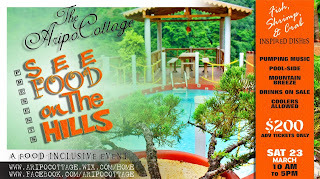 for example, SEE FOOD ON THE HILLS; a food inclusive, "bring-yuh-cooler-an'-come" lime at the aripo cottage, coming up on march 23rd. i heard a lot about the nature resort up in the hills, but due to my love of concrete and air conditioning, i never ventured to it... until recently. went up to take a peep at the location for this grand seafood affair. swine of the wild variety. unicorns. hmm. on second thought, they might have been ponies. and no serious collection of animals would be complete without some birds. relaxing. though the event wouldn't allow access to the river as it's a decent walk away from the main cottages (a walk that made me renew my gym membership immediately after), knowing it's there is enough vibes. and just a lot of open spaces to assemble with your squad, your cooler and platefuls of seafood inspired dishes. i can't let the cat out the bag as yet, but the menu sounds impressive. all in all, the visit was enough to make me sign up for the 23rd. seems like it would be a different experience, i'm thinking brunch meets seafood joint meets cooler fete. interesting if yuh ask me. but don't wait on the review to find out how it was. grab yuh cooler, grab yuh crew and come. i even took a few tickets so if you need some, you can message me. seems like everything about this blog entry was late. i arrived to the blogger's table late, i ate late, i left late. i guess it was inevitable that i would post late. and believe me, it wasn't because i didn't try. just like the accident on the highway in the middle of rush hour jus so jus so which stuck me in the east, things just kept popping up. and carnival didn't help. aaaaanyway, this all started when corey from learning patience decided it was a good idea to include more bloggers on some blates. so she did her usual campaigning and sold the idea of a bloggers' table to alison at chaud cafe. next thing yuh know, emails were peltin' back and forth and the lovely alison was welcoming me to chaud cafe... my first time. nice. cozy inside and a nice spacious terrace to dine or have drinks on as well. i could see myself doin' this. great settings to link up with all my homebloggers. sarina from trinigourmet (left) and corey. melissa from belly in hand. and the elusive trinichow herself, who only volunteered 1/3 of her likeness for the camera. well honestly, she didn't volunteer any of her likeness for the camera, but i had to post something so people wouldn't think i was makin' it up. i love pork. there, i' said it... again. so the portuguese garlic pork belly was a nice way to start. a crispy log of well seasoned pork topped with salsa verde. very very tasty. literally mouth watering. the really nice part about this dish though, was 3 out of the 5 bloggers aren't pork fans, so guess what? epic mealments of the pork variety!! i snapped a shot of this grouper po boy served with slaw and a creole remoulade on french bread. it wasn't my intention to sample it, but i took a little bite. nice. well seasoned fish with the tang of of the creole dressing and the fresh bite of slaw. i'm no lover of fish sandwiches, but i could be in the mood for this now and again. the salmon crudo was gape-worthy and sounded interesting. salmon, orange slices, olives and crispy fried capers drizzled with a balsamic syrup. all the raves about the great crispy capers were tempting, but i didn't venture in. my experience with cous cous is very limited, so i try to sample it whenever i can to see what people do with it. the grilled vegetable cous cous was a nice spin on it. earthy is how i'd describe it. a nice veggie flavor with the versatility to make a great side for a lot of things. case in point, this atlantic salmon spiedini. this was my favorite for the evening. i'll swing back for this fuh sho! from the time it came out i was feelin' the presentation. the lil obscure mound of cous cous balancing on the side and the skewer of herb topped salmon across the top. then the burst of color from that tomato sauce. even though when it came down to business, all that went to hell. if ripping fish off the skewer and mixing everything up is wrong, call me a circle... because that produced the perfect bites. explosion!! the guava bbq diver scallops came recommended by a friend (mel mel, where yuh at?!) so i ordered it. what i didn't know was that the dish comes with cheesy grits and topped with sweet potato paille. i like grits, but i'm not an expert, so i can't say if they were well done or not. cheesy and nice however is something i think i am qualified to say. the scallops were grilled and topped with the guava bbq sauce. cooked perfectly so they were tender and succulent. i enjoyed the flavors. and the fried strips of sweet potato created good texture. by this time, a brotha was filled to capacity. so dessert wasn't happening in qtown. meanwhile, the table was going wild over this flourless chocolate cake with sour cream sherbert. only mmms and aaahs. just when i thought it was a chocolate thing, the warm apple crumble with brown butter-pecan ice cream came out on a fancy platter. i sat this one out too, but the cinnamon smell was a huge clue of what was taking place. my dessert however... gin and tonic. wedge of lime. so after sharing all the trade secrets of our blogging worlds and exchanging stories about where to eat, where not to eat and why, it was time to head out. apart from hooking up with fellow bloggers, chaud cafe was cool enough to entice me to head back again. nice variety, great ambiance to share with friends. yeah... i'll be back.